But there’s still a lot of things to do next. In addition to housing, there’s still the application for loans and bursaries (Kakur just found out for current conditions I am already short on cash! ), the course selection for next term (should I switch to Software Engineering? How’s Visual Arts for a minor?) 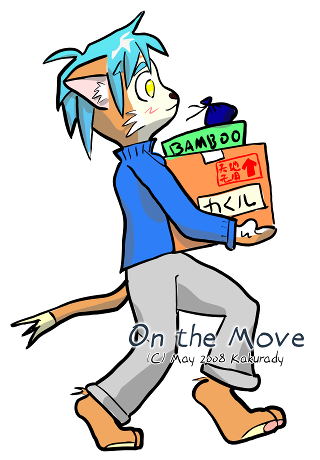 and my own interests (manga / Japanese)… and the cafeteria does not run in the summer, thus I may also acquire Cooking skill Rank F. Even if I don’t try to find work outside, this is sure going to be a very interesting summer. 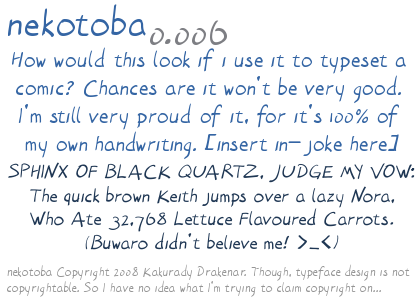 By the way, I was kinda bored after the test, so I made a font called Nekotoba, based on my own handwriting. Even it’s only directly taking my handwriting and making it into a font, it took me two evenings. Now it has all 96 characters from ASCII, and punctuation like quotes for a total of 105 glyphs. The next target is, of course, ideographs from Chinese national standard GB2312, but the number of Han Characters is epic. The number of Kanji in use in Japan (in other words, the characters taught in school) is about 1900, and the glyphs defined in GB2312 is 6763 (don’t know whether Japanese Kana) and symbols count towards this 6763). Six thousand ideographs… that’s so gonna kill a cat.